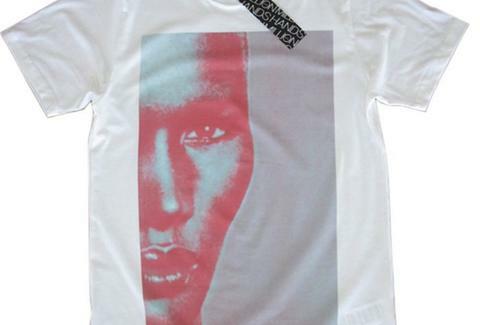 From a Brit DJ and producer comes this new summer drop of "eco screen printed" tees, including "Big Grace" (featuring a huge Grace Jones closeup), "STSS" (splashing the co-designer -- Norwegian indie label "Smalltown Supersound" -- across two circles), and "A-Z O Face", concealing a "cheeky hidden o-face" amongst an "a-z of musical maestros, trailblazers & Genii": hundreds of artist names, from Al Green, to Depeche Mode, to The Sugarhill Gang, to Wham! (so, guess who the cheeky o-face is? ).